Iraqi And Kurdish Forces Agree To Pause Fighting : The Two-Way This has the potential to open the door for talks, after Iraqi forces moved to wrest territory from the Kurds, including the oil-rich city of Kirkuk. Iraq opposed a Kurdish independence referendum. 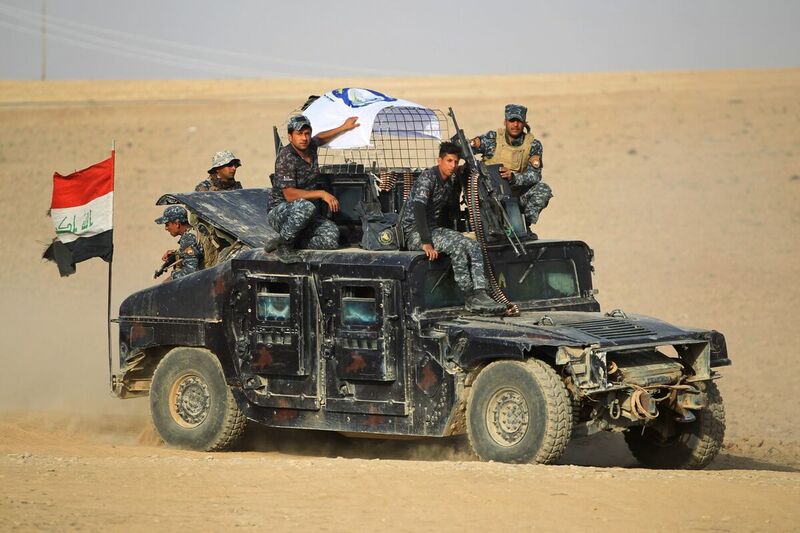 Iraqi security forces advancing Thursday towards the town of Faysh Khabur, which is located on the Turkish and Syrian borders in the Iraqi Kurdish autonomous region. Iraqi and Kurdish forces have agreed to temporarily pause their fighting. This has the potential to open the door for talks, NPR's Jane Arraf reports, after Iraqi forces moved to wrest territory from the Kurds, including the oil-rich city of Kirkuk. The Kurdish autonomous region held a non-binding independence referendum last month, despite the opposition of Iraq's government and other regional and international powers. Voters overwhelmingly approved the proposal. Earlier this week, the Kurdish regional government offered to freeze its bid for independence, an offer the Iraqi government did not accept. It has urged the Kurds to void the results. Then came the ceasefire announcement. "Kurdish officials say the agreement was brokered by the United States," as Jane reports. "U.S. Secretary of State Rex Tillerson called Iraqi Prime Minister Haider al-Abadi to urge him to enter talks with the Kurds." Abadi said in a statement that he halted troop movements for 24 hours to allow for discussions about deploying federal Iraqi forces to disputed areas and the international border. He added that this is to "prevent a confrontation and bloodshed between sons of the same country." One of the areas that Abadi said the forces will focus on is the Fish-Khabur area, which the Kurdish Rudaw network says is a point "located within undisputed Kurdistan Region territory where it borders Turkey and Syria." "The ceasefire is holding," said Vahal Ali, the media director for Kurdish President Masoud Barzani, as Reuters reported. The fighting that erupted earlier this month in areas that were under Kurdish control has displaced more than 160,000 civilians, according to Kurdish regional authorities. Iraq's Kurdish authorities operate autonomously. They have their own security forces, the Peshmerga, which has played a major role in the fight against ISIS. "We are following events in north #Iraq," State Department spokesperson Heather Nauert said in a tweet. "Dialogue remains the best option to defuse tensions. We welcome & encourage coordination by both sides." Army Col. Ryan Dillon, a spokesman for the U.S.-led coalition against ISIS, stated that this was not an official "ceasefire," though both parties are talking with one another.